Latching relay (a.k.a. impulse relay) can be turned on and off by momentarily applying a voltage across the relay coil. The relay would maintain in its last switched state without the need to maintain the coil current. In this post, I will show a simple circuit which can be used to drive such relays. In the video towards the end, I also included more explanations and some demonstrations. The relay I am using here is a latching RF relay. 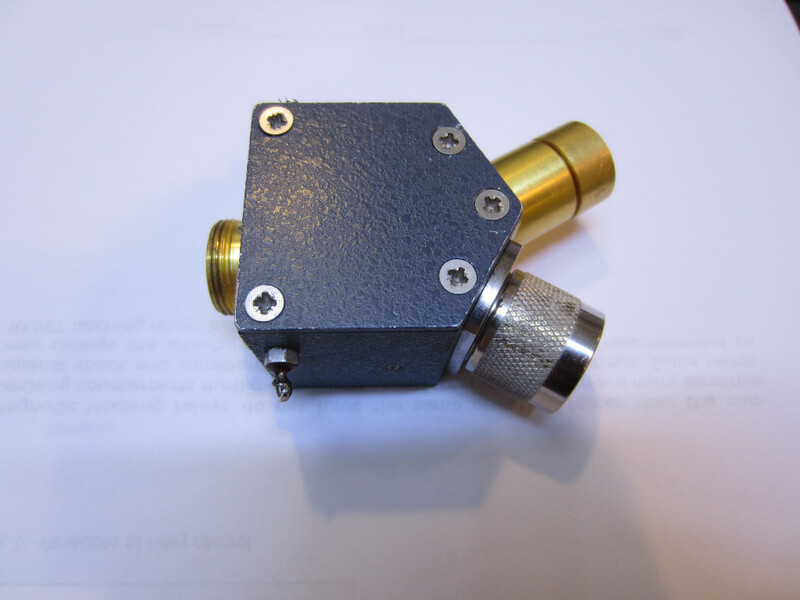 It is used to switch the input signal between its two outputs. For this particular relay, the input has an APC-7 connector. One side of the output has an N connector and the other side is 50 Ohm terminated. Although this relay is an RF relay, the method I described below is applicable to any latching relays. Many dedicated ICs (such as MAX4820, MAX4821) can be used for driving such relays. Because of nature of the latching relay, no H-bridge is needed (although you can definitely use an H-bridge, but it would be wasteful). 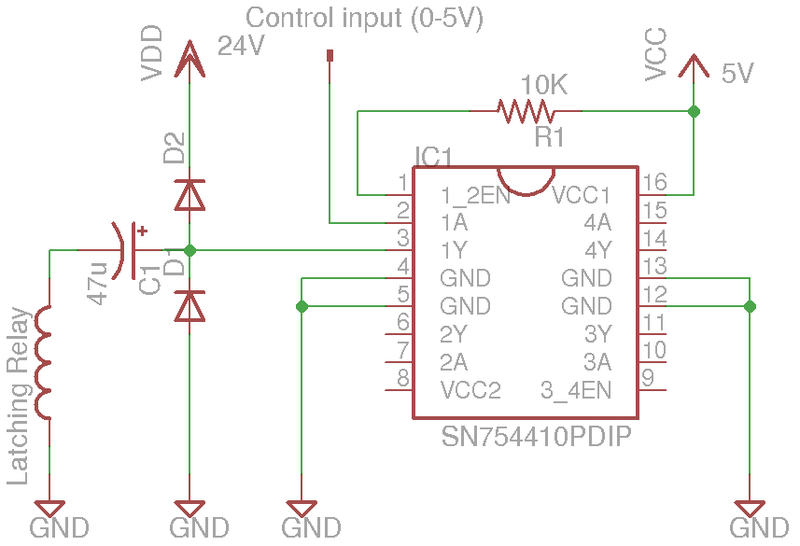 The circuit I have here uses an SN754410 quad H-bridge driver chip. Only one of the four half-bridges is used. In fact, you can pretty much use any circuitry with a push-pull output configuration as long it can provide sufficient impulse current. 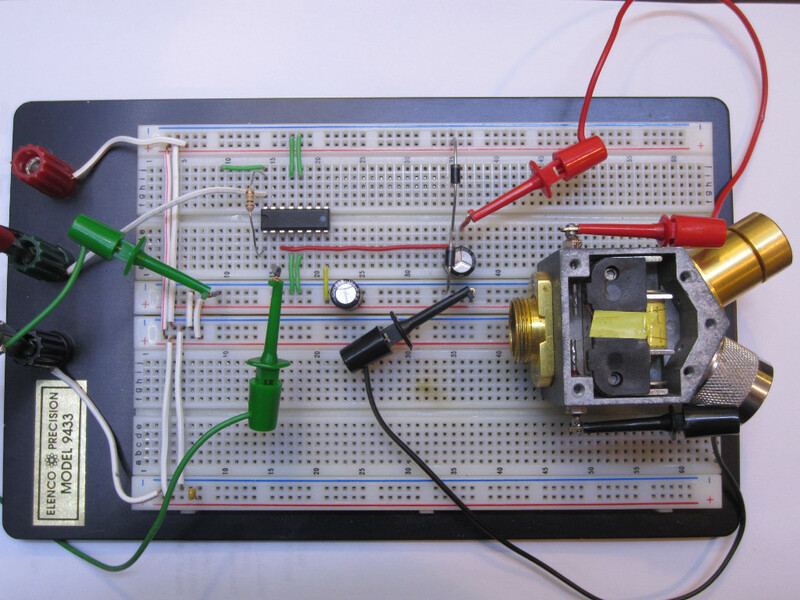 The key element in this circuit is the output capacitor. When the push-pull output is high the current flows through the capacitor to charge it and this impulse current also turns on the relay. Once the capacitor is charged, the output current reduces to zero. 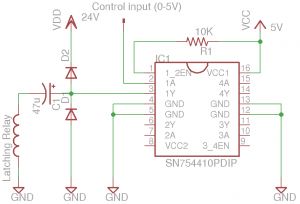 When the relay direction needs to be reversed, we can simply pull the output low and positive terminal of the capacitor is grounded in this case. Thus the current flows the other way around through the relay coil, engaging the relay while discharging the capacitor. as pointed out in this application note. In practice though, a 10 to 100 microfarad capacitor would be sufficient for most types of latching relays. Finally, in this video below, I included more details on how a latching relay works and discussed a few different driving methods. The only problem with that deceptively simple circuit, is what happens when the DC supply fails? In some circumstances the relay will change state, & that may not be what’s wanted. When the supply is removed the positive side of the capacitor is essentially float so the state is maintained. However, what’s not certain is what happens when power is restored. Depending on the charging state of the capacitor, it may or may not provide sufficient current to drive the relay to its desired state. So you may need to “cycle” through the states a couple of times before everything is brought back to a known state.